That's me! The cricket who keeps Pinocchio to the straight and narrow. I'm along on the quest as the royal chronicler. That's right, me again. I'm keeping a journal of everyone's adventures. I also act as Pinocchio's conscience, so he'll know right from wrong. Glad you could join us! Cricket's the name — Jiminy Cricket. Queen Minnie asked me to come along on this quest as the Royal Chronicler. And what an adventure it's been! You might remember that I also help my pal Pinocchio out as his official conscience. I try to keep the little fellow on the straight and narrow and show him right from wrong. He sure can be a handful sometimes. The cricket in charge of jotting down everything that goes on in Disney Castle. He also joined Sora on his adventures and kept a record of them in two journals. One of those books was almost completely erased (it's a long story). And when a mysterious message appeared in that same book, out of nowhere... Well, that's how this latest adventure began. A faithful friend whom the Blue Fairy has appointed Pinocchio's conscience. A cricket, a gentleman, and a record keeper. Hello, worlds! Cricket's the name—Jiminy Cricket. I'll be tagging along with Sora and the others, chronicling every moment of our grand adventure. It's good to be back! "Cricket's the name. Jiminy Cricket, at your service." 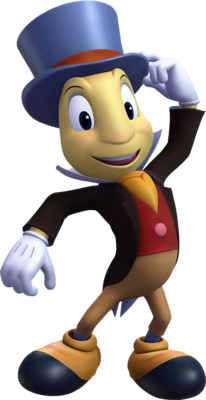 Jiminy Cricket is a character that appears in many of the Kingdom Hearts games. He is originally from the film Pinocchio. Jiminy was assigned by the Blue Fairy to be Pinocchio's conscience due to being too young to know the difference between right and wrong. Unfortunately, the Heartless destroyed their world, Prankster's Paradise, which caused them to become separated. Before Donald and Goofy prepare to leave Disney Castle to search for the "Key" under King Mickey's orders, Queen Minnie tasks Jiminy to join them on their journey as their royal chronicler. He explains to Goofy that he escaped right before his world was destroyed, and he was scattered from his friends. After they befriend Sora, they travel to many different worlds in search for the King, Riku, and Kairi, although Jiminy usually rides unseen in Sora's pocket. At one point[please confirm], Jiminy meets up with Pinocchio in Traverse Town, and tells him to stay put while he sets out to find Geppetto, his father. As they venture past Agrabah, the Gummi Ship is swallowed by the giant whale Monstro and the team meet up with Pinocchio again, who is then reunited with his father Geppetto. However, Pinocchio was lured away from his friends by Riku and they searched for him until a Parasite Cage Heartless captured Pinocchio and attempted to take his heart. He failed, but then Riku captured him and stole his heart in hopes to be able to replace Kairi's heart. Jiminy, Sora, Donald, and Goofy manage to restore Pinocchio's heart with the united power of their hearts. Then, they battle Parasite Cage again and defeat it once and for all, but then Monstro feels ill and spit them out and separates Jiminy away from Pinocchio. He finds out that Pinocchio and Geppetto are okay after they visit Traverse Town again and find them living there. Upon entering Castle Oblivion, Sora and company realize that their memories are disappearing the more they head for each level of Castle Oblivion, and Jiminy's entries in his journal have disappeared altogether. When Sora gets angry at Donald and Goofy for not wanting to help save Naminé, he sets out to find her by himself. Jiminy tries to reason with him, but he refuses to listen. When they finally meet Naminé, they learn that Sora never knew Naminé, but were rather fooled by her abilities to control memories of Sora and those attached to his heart. After Sora and Co. defeated Larxene, Vexen, and Marluxia, the members of Organization XIII, Naminé takes them to a room of Memory Pods, where she tells them she will be able to restore their memories while they sleep in them. However, as a price they will lose their memories of all things that happened while they were in Castle Oblivion. Afraid that they might not be able to thank her for what she does for them, Jiminy writes down a small entry in his journal that says "Thank Naminé". Sora, Donald, Goofy, and Jiminy awake from their year-long slumber in Twilight Town, and have no memories of what happened right after they closed the door to Kingdom Hearts. Goofy asks Jiminy what his journal says, and Jiminy only finds a sentence: "Thank Naminé". Unable to know who she is anymore, Donald scoffs at him for his bad journal entry and Jiminy dismisses it by telling him to go and find out where they are. In the Mysterious Tower, when Sora, Donald, and Goofy find the first Puzzle piece, Jiminy jumps down to examine it before placing it in his journal. After returning to Disney Castle, Jiminy finds a mysterious sentence saying "We must return to free them from their torment" while reorganizing his journal. Jiminy cannot recall any memory of that entry, so he shows the text to King Mickey. To investigate, King Mickey creates a Sora out of data to try and find out more about the mysterious entries that continually appear. As Data-Sora continues to unravel the Bug Blox corruption that is affecting the Datascape, Jiminy somehow gets sucked into the data world, along with King Mickey, Donald, Goofy and Pete. He and his friends are sent back to the real world after the debugging of the journal is complete. Because Jiminy Cricket managed to escape Prankster's Paradise before it became one of the Sleeping Worlds, a simulacrum of Jiminy takes his place in the world's "dream", still appearing a Pinocchio's conscience. Upon arriving in Prankster's Paradise, Sora meets Jiminy, and despite Sora's efforts, Jiminy does not remember him. Jiminy tells Sora that Pinocchio had told him when he was locked in a cage, that man in a black coat was to play a trick on Sora. The two friends then set out in search of the missing Pinocchio. After being misled around the Amusement Park by two Jestabocky Dream Eaters disguised as Pinocchio, the two eventually find him at the Circus, partially transformed into a donkey because of his misbehavior. Sora saves the puppet from the Dream Eaters, then orders him and Jiminy to leave. They are then notified by the Blue Fairy that Geppetto has been swallowed by Monstro, and they jump off a cliff into the ocean to rescue him. Sora follows them to the bottom of the ocean after the Blue Fairy informs them of their actions, watching as they are attacked and swallowed by the whale. After Sora defeats the Chill Clawbster, he muses that the world must have been destroyed by the Heartless after this point, resulting in Jiminy and Pinocchio's separation from Geppetto. Pinocchio talks to Riku about how Jiminy has been there for him to help him see right from wrong. When Riku meets Geppetto and Jiminy inside Monstro's mouth, trying to find to Pinocchio, who left with someone in a black coat. Jiminy accompanies Riku as he searches for the puppet, and they eventually find him and the black-coated figure. The figure prompts Pinocchio to return to Jiminy and Riku, and removes his hood to reveal that he is a doppelgänger of Riku before disappearing in a corridor of darkness. Riku tells Jiminy and Pinocchio about his dark past, and Jiminy and Pinocchio ask if Riku has a friend to serve as his conscience, reminding him of Sora. Hearing a roar in the distance, Riku sends Jiminy and Pinocchio back to Geppetto while he fights the Char Clawbster. True to his name, Jiminy is an anthropomorphized cricket, though he bears virtually no resemblance to real-life crickets. He has olive skin, thin black eyebrows, four-fingered hands, and wears the famous white gloves many older Disney characters wear. He dresses very formally, wearing a royal blue top hat with an orange band near the base, a red vest with a single, pink button on the front, a yellow ascot, a black blazer, and a high-collared white shirt. He also sports tan pants and yellow shoes with black tips. Jiminy also carries a red umbrella. In Pinocchio, Jiminy serves as the main character's conscience. The Blue Fairy, who brought Pinocchio's puppet body to life, gave Jiminy the task of guiding him and helping him to determine right from wrong. However, Pinocchio's naïveté, more than once, gets the better of him, leading to Jiminy losing his temper several times and scolding him. At one point, Jiminy prepares to abandon Pinocchio altogether when Pinocchio inadvertently chooses a naughty boy named Lampwick over Jiminy, but rushes to the puppet's aid upon realizing he is in danger. Eventually, their friendship prevails and Pinocchio, despite sacrificing his life to save his father from Monstro, is turned into a real boy. Jiminy, for his part, is awarded a golden badge as a sign of his amazing conscience capabilities.